GWCT News & Advisory: Is it time to ban heather burning? Today some were quick to seize upon some of the negative findings within a report on heather burning. The University of Leeds looked at the impact on water hydrology. Are they right to leap to swift conclusions? Do we need to immediately ban burning? The report needs proper review but it looks perfectly sensible - let’s assume all the findings are correct. What next? Bring in a ban tomorrow? I feel that is a knee jerk reaction. In the lowlands our farmers are busy ploughing their fields - yet there is plenty of evidence that ploughing causes similar water quality issues… discolouration, siltation etc. We could just as easily rush around saying that ploughing should be banned. We don’t. We can’t ban ploughing because it is a really important land management tool. Instead a lot of very good work has been done to reduce the impacts by using buffer strips, contour ploughing, rotational ploughing and ways of doing ploughing better so that we get the benefits of ploughing but not the downside. You can download Natural England's Heather & Grass Burning Code here. 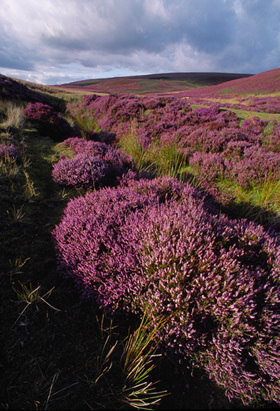 In a European context heather moorland of the sort maintained by grouse shooting is one of the rarest habitat types and enjoys some of the highest conservation designations. These wonderful places only exist because generations of owners have refused huge grants from successive governments to drain them, fence them, plant conifers on them, carpet them with sheep and cover them with roads and tracks. Properly conducted grouse shooting is a force for good in the uplands. It can and must study and learn from research but its demise would be a disaster for the landscape, biodiversity, global warming and many small but locally important rural economies.